The tiger swallowtail butterfly is so interesting because its vivid dark jagged stripes against yellow wings look like the fur of a tiger. I have chosen to create a graceful, jeweled, classically colored female of the species, papilio glaucus, as the male lacks the bright color blue and the gaudy golden topaz color of the rear wing edges. This stitched version is almost life-sized, but I did have to take artistic liberties due to the scale of the media. Butterflies are so amazingly delicate! The size of the stitching materials made it impossible to achieve an exact biologically correct result. 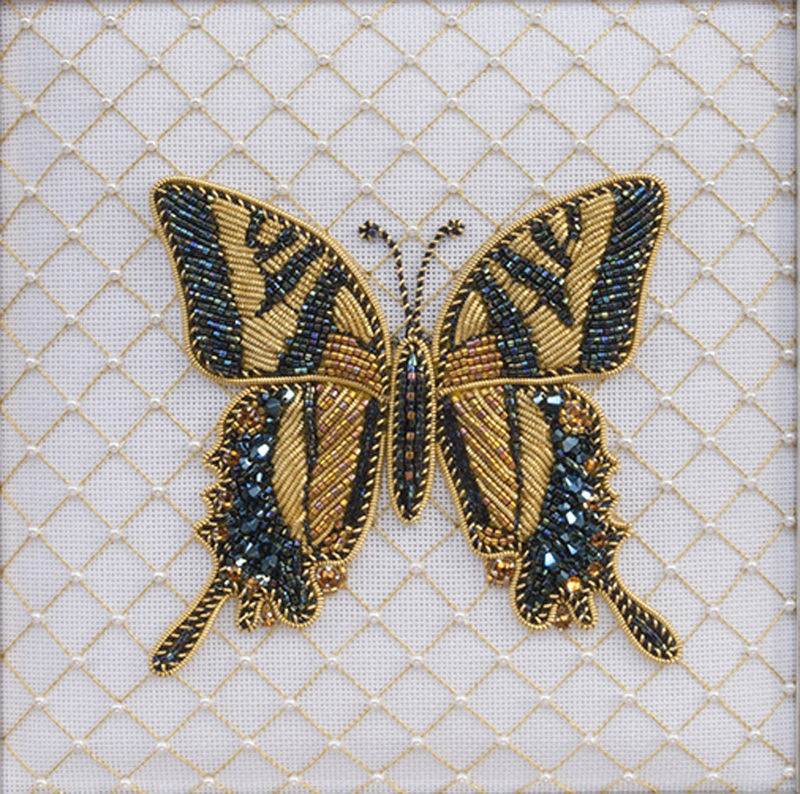 Techniques include: pearled needlepoint lattice, several traditional raised goldwork techniques, and a variety of beading techniques. Materials include: English gold bullion pearl purl and bright check purl; Kreinik metallic braids and cords; Swarovski double aurora borealis bicone and montee crystals; Japanese beads and pearls; Congress cloth; padding and other materials.